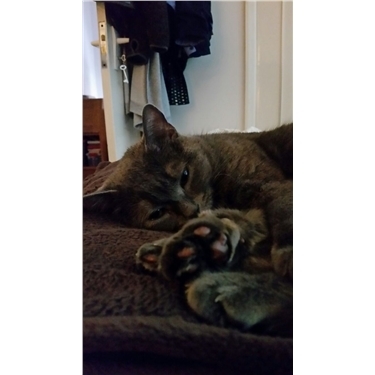 We love hearing from the wonderful people who have adopted cats from Woking Cats Protection and getting updates on how the kitties are settling into their loving new homes. We recently heard from Smokey's new family and here is what they said. We were very lucky to be given the opportunity to adopt Smokey on 26th December 2016. Pauline brought Smokey to our house, where we settled her in to the back bedroom. Smokey was very nervous and hid under the bed for the first two days, only venturing out to eat and use the facilities then straight back to safety under the bed. On the third day, she felt a little braver and came out from under the bed in the daytime and meowed a few times. Slowly but surely, day by day she got a little braver and ventured downstairs to check out her new home... It's now April and Smokey has really settled in nicely. She sleeps on our bed every night, and 5.30am every morning, reminds us it's time for breakfast. She has taken a particular liking to our sunny windowsills and lays in the sunshine with a very contented purrrr... She also likes a game of 'catball' in the hallway most evenings before dinner, usually followed by a 10 minute run around the house at high speed! We wanted to thank everyone at Cats Protection for our lovely Smokey who has made our home and family complete. Smokey is currently sitting next to me, nudging me, reminding me it's dinner time, so I have to go now. Such stories give us so much pleasure. Thank you to Smokey's family for sharing it with us.